An anti-gay archbishop? Unthinkable! Well, OK, maybe not. Archbishop Terrence Prendergast of the Halifax archdiocese has demanded that his priests refuse holy communion to Daniel Poirier and Jack Murphy, an elderly gay couple. The unexpected and swift punishment came after the two 69-year-olds published their wedding announcement in a local newspaper. The couple, who have been Roman Catholic their entire lives, were completely shocked. The church also removed Daniel from his position as choir director. Ah, isn’t the Catholic Church enlightened? 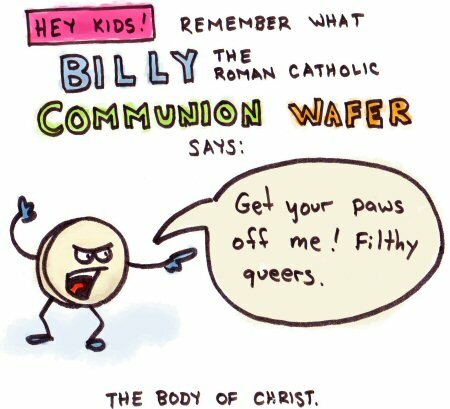 It’s such a simple idea: Judge others harshly in front of friends and community by exploiting the Holy Sacrament! After all, gay sinners are, like, 50 cagillion times worse than straight sinners. That’s the Church’s motto, right? Well, until Monday, folks! Have a great weeken—oh, wait, no. There was some other recent news I was supposed to remember to tell you guys about today… What was it? Something about a vote—a defeated motion, maybe? I think it might have involved a 52-vote margin. Oh well, I’m sure it was nothing newsworthy.